In the first post of this series, I introduced my 5th great grandmother, Charlotte Richardson and the two competing theories as to who her parents were. In order to test those theories, I first had to identify some possible matches. In order to find people who carry the mtDNA of Mary Flintoff and Barbara Richardson, I followed as many lines as I could in order to increase my chances of finding some living descendants who would agree to be tested. Mary Flintoff had one known daughter, Elizabeth. She had one daughter, who had two daughters. I pursued this line, but since there was only one line to follow and I didn’t want to put all my eggs in one basket, I also looked at Mary Flintoff’s sister, Jane, who would carry the same mitochondrial DNA (assuming, of course, they had the same mother). Jane had 2 daughters, who between them had 8 daughters. One of Jane’s daughters, Elizabeth Humphrey, married Charles Dixon Jr. They left Sackville, New Brunswick in September 1837 with their 7 youngest children for Kirtland, Ohio where they joined the Church of Jesus Christ of Latter Day Saints. This would prove to be the easiest line to follow, due to the excellent genealogical record-keeping of the Mormons. For Theory 2, Barbara Richardson had 5 daughters, who had 16 daughters among them. There were lots of choices of lines to pursue there, so when one line would fizzle out, there were others to try. I worked systematically through each daughter and each daughter’s daughter until I got as far as I could go, then I’d go back a generation and start again with the next one. While following the lines to present day, I used readily-available online sources. I used some Ancestry trees for hints, but I didn’t want to end up testing someone who wasn’t actually a descendant due to shaky trees. I started with the easy-to-access sources and figured I would dig deeper if I got stuck. Fortunately, I was able to get to present day on several lines using only online sources, through Family Search, Ancestry, Nova Scotia and New Brunswick Archives online, Find a Grave and Google searches, which were especially useful for recent obituaries. Doing this, I discovered that it’s much easier to get to living descendants on lines that went to the US than on those that stayed in Canada. That 1940 census is very helpful when you’re trying to get to present day! Throughout the process, I documented everything, including the sources I used. I created WikiTree profiles for each person, for a few reasons – First off, WikiTree is what I use for my own family research, so I’m used to it and I believe in the mandate of a collaborative family tree. I figured I may as well make this research available for others to benefit from and add to. As well, there was always the possibility that I would connect to trees already on WikiTree, which would save me some research. I did connect a few times to existing trees, but not on the lines I was interested in. But most importantly, WikiTree is great cousin bait. Since each profile is its own web page, when you search for a name in Google, the WikiTree profile will show up as a hit. And as you’ll see later, this would prove to come in very handy. In addition to documenting on WikiTree, I also kept a running list in Evernote of where I was, who I had reviewed, and which lines had ended. On some, sources I checked had conflicting evidence. I didn’t want to spend a whole lot of time going down the line of someone who might not even be related. Some people I lost track of. I had several avenues to pursue, so I didn’t waste time trying to find people who couldn’t easily be found, but I knew I could always go back to them if I needed to. When I came upon a possible contact, I added a checkbox beside their name. Once I had contacted them, I checked the box. One I worked through the lines, I had about 10 possible living female-line descendants identified. Next came the fun part – making contact and asking people to give a cheek swab for a total stranger! I’ll cover that in the next post. 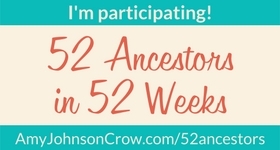 I did this research in 2016 and presented my findings at the British Isles Family History Society of Greater Ottawa (BIFHSGO) annual conference in September 2016, on a panel called “Making Connections: Adventures in Genetic Genealogy”. This is an adaptation of that presentation. Charlotte Richardson was my 5th great grandmother, along my maternal line. While I’m fortunate to be able to go back 7 generations and 240 years on this line, I was stuck on Charlotte. And you know how it is…. we always want to get further back! Charlotte was born in 1776 in New Brunswick or Prince Edward Island (now Canada), depending on which census you believe. On the 1851 NB census she was said to have been born there. The 1861 census has her birthplace as PEI. She married Richard Dobson when she was 18. Richard was born in 1769 in Yorkshire, England. In 1773, when Richard was 4, he and his family were among the over 1,000 immigrants from Yorkshire who settled in the Chignecto Isthmus (the neck of land that joins New Brunswick and Nova Scotia) between 1772 and 1775. Richard and Charlotte settled in Cape Tormentine, NB where they raised 12 children. You can read more about Charlotte, including the conclusions to this research, in my last blog post, 52 Ancestors #3: Charlotte Richardson (1776-aft.1861). If you’d rather not have spoilers on how this research turned out, you may want to wait until the series is over to read that post. 94 trees had unknown parents. There was also one tree with completely different parents, born about 1850. Since they would have born 75 years after their daughter, I went out on a limb and ignored that as a possibility. Theory 1: Charlotte was the daughter of John Christopher Richardson & Mary Flintoff. John & Mary were Yorkshire immigrants who arrived in Canada about the same time as the Dobsons. They settled in Sackville, which was not far from where Richard & Charlotte later lived. John and Mary did have a daughter named Charlotte, but one source, a history of Sackville published in 1933, says that she married someone named Horton. Other sources say she married Richard Dobson. But none of these are primary sources. Theory 2: One of the researchers of the Dobsons has a letter from 1941 that says that Charlotte was the daughter of a British Army Officer, whose regiment was then stationed at Charlottetown, PEI. Obviously it would be hard to test this theory directly with little else known. But, there could be an indirect way. Theory 2a: There was also a Barbara Ann Richardson, born in Charlottetown in 1782 (6 years after Charlotte), who married James Ingraham and settled in Cape Breton, Nova Scotia. Some people have speculated that they might have been sisters, due to the strong links between Charlotte’s family and Barbara Ann’s family. Two of Charlotte’s sons married two of Barbara Ann’s daughters. If I matched someone on Mary Flintoff’s line, it would confirm that Charlotte was the daughter of John Christopher Richardson and Mary Flintoff. If I matched someone on Barbara Richardson’s line, it would confirm that they were sisters, but I still wouldn’t know who their parents were. I would, however, know that I was looking for someone who lived on Prince Edward Island between 1776, when Charlotte was born, and 1782, when Barbara was born. If I matched both, it would confirm that Charlotte and Barbara were sisters AND they were both the daughters of John Richardson & Mary Flintoff. Or of course, I could match neither. In that case, not only would Charlotte’s parents be unknown, I would have no evidence supporting the theory that Charlotte and Barbara were sisters. This could be because they weren’t, or because one or both trees were wrong, either due to misattributed parents or a non-parental event. In the next post, I’ll provide details on how I identified potential matches. Meanwhile, I’d love to hear your experiences with using mtDNA.